Aviary - ​Aviary is a fun and simple way to make beautiful photos in ​seconds. Use professionally designed filters, creative stickers and frames, touch-up tools and more to create and share amazing pics! The Daily Create - This site gives people the challenges to use and create art everyday. Anyone can get on and participate in the daily create challenge of the day. This can be useful for yourself or children who are interested in art and want to be challenged daily. You can even use it in the classroom to encourage creativity and art in a fun and easy way. drawspace.com – Free online drawing lessons. ctrlpaint.com – A free learning resource dedicated to the basics of digital painting. exposureguide.com – Photography news, tips, and tutorials blog. cambridgeincolour.com – A learning community for photographers. khanacademy.org – Learn art history basics from cave paintings to contemporary art and everything in between. googleartproject.com – Collections of famous artworks. photography.bastardsbook.com – An open source guide to working with light. artgraphica.net – Learn to sketch, draw, and paint with free lessons. enliighten.com – Learn digital painting using Photoshop. 500px - 500px is a Pinterest-like photo community powered by creative people worldwide that lets you discover, share, buy, and sell inspiring photographs. The site is not moderated, and there are categories of art only for mature audiences. A preference can be selected that will exclude mature art from view. Flickr - Flickr is the great way to store, sort, search and share your photos online. Flickr helps you organize that huge mass of photos you have and offers a way for you and your friends and family to tell stories about them. The free version of Flickr gives you up to a terabyte of online storage. GIMP - GIMP is a free cross-platform image editor available for GNU/Linux, OS X, Windows and more operating systems. Whether you are a graphic designer, photographer, illustrator, or scientist, GIMP provides you with sophisticated tools to get your job done. Gimpshop - Gimpshop is a free alternative to Adobe Photoshop. Restore, touch up and manipulate photos, create complex animations, or just use Gimpshop as a simple paint program. The Google Arts & Culture - The Google Art Project is a unique collaboration with some of the world’s most acclaimed art institutions to enable people to discover and view artworks online in extraordinary detail. Working with over 250 institutions, we have put tens of thousands of works of art from more than 6,000 artists online. This involved taking a selection of super high resolution images of famous artworks, as well as collating more than thirty thousand other images into one place. It also included building 360 degree tours of individual galleries using Street View ‘indoor’ technology. The project has expanded dramatically since it first launched. More than 45,000 objects are now available to view in high resolution, an increase from 1,000 in the first version. Street View images now cover over 60 museums, with more on the way. Google Photos - Google Photos is an online cloud to store photos and videos free of charge and with unlimited storage! Google Photos organizes your photos for you, while also giving you the option to make albums and easily share your pictures with friends and family. Heilbrunn Timeline of Art History – If you are interested in taking a quick look into the history of art, this is the site for you. On this site, part of the Metropolitan Museum of Art, you can look up different eras in history and learn about and see examples of the art that existed at that time; from 8,000 B.C. to the present. You can also search by country or region to see what art was found there. The Timeline presents a chronological, geographical, and thematic exploration of global art history through The Met collection. 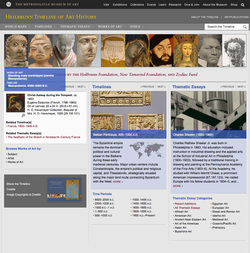 It is a reference, research, and teaching tool conceived for students and scholars of art history. It is authored by The Met experts, and comprises 300 chronologies and close to 1,000 essays and more than 7,000 works of art. It is regularly updated and enriched to provide new scholarship and insights on the collection. The Internet Archive - Magazine Rack: The Internet Archive has just added a new section - the Magazine Rack. This is an archive of over 130,000 magazines from over the past century. You can search for magazines by title, topic, collection, and more. If you search for "photo" or "painting" or similar keywords, you'll find many past magazines on these topics. A warning, though. Do not let children loose in here - there are adult magazines as well. Krita - Krita is a professional FREE and open source painting program. It is made by artists that want to see affordable art tools for everyone. LIFE Magazine - Classic pictures from LIFE magazine's archives. You can scroll through countless TIME Magazine covers from many decades ago. These vintage photo covers will likely make you nostalgic for the good 'ole days. The Louvre Museum - Take a virtual tour of one of the world's finest art museums - The Louvre in Paris, France. There are also great teacher resources available on the Louvre Museum website. Some new sections are available for free on our website to help you prepare and follow up your visit, or for use in your classroom. These new modules are designed for educational purposes, to encourage young people’s interest in art and civilizations. Use them at home with your children or if you're an educator, incorporate them into your lesson plans. They have options for all ages to explore and better understand art. With the Tales of the Museum Workshop, children get the chance to merge art and technology together to learn from the 1st director of the Louvre Museum Dominique- Vivant Denon about the art treasures he has in this room. MyShoebox - Free unlimited photo backup. Unify photos & access from anywhere - Windows, Mac, iPhone, iPad and Android. Only you can access your photos. Your photos are stored with the same encryption used by banks. Nothing is ever shared without your explicit permission. Did we mention, unlimited backup is free! My​Shoebox automatically finds the top events of your life, the places you have traveled and helps you rediscover them from your phone and tablet. We never delete or move photos on your computer, all the organization is done on our service. My​Shoebox will automatically keep your photos backed up from your computer, phone and tablet. No external hard drives or manual syncing. My​Shoebox lets you access your entire photo collection from any device without taking up storage space. After a vacation, photos end up spread across your friends and family. My​Shoebox Shared Galleries is the easiest way to build a shared gallery with friends and family. Photos are automatically organized by time and contributor. You can read a review and watch a video here. PicCollage - PicCollage is an app that allows users to easily create beautiful photo collages. ​PopPhoto - Popular Photography Magazine. PopPhoto gives you a chance to enter their photo contests to get your photography out there for a wider exposure. You can see new trends in lens, film, Photoshop, etc. going on in the world of photography today. You can look through their photo of the day page to get inspiration for your own photos and see what others in the photo community are shooting. Also check out their how-to page that can give you tutorials on different photography tricks and techniques. Saatchi Art - Saatchi Art is the world's leading online art gallery, connecting people with art and artists they love. Saatchi Art offers an unparalleled selection of paintings, drawings, sculpture and photography in a range of prices, and it provides artists from around the world with an expertly curated environment in which to exhibit and sell their work. With Saatchi Art you can work with your own curator and get free advice on which pieces are right for you. Their free advisory service gives you access to an expert curator at no charge. SketchUp - SketchUp Free is the easiest way to draw in 3D, now delivered in a web browser. Draw, orbit, push-pull: make anything you can imagine, however you envision it. Stock Photo Sites (Free Images) - looking for free stock photos? Here's a few sites for you!